Medelita is adding a new men’s lab coat to its slim fit collection in January, 2014. The H.W. Cushing fits more like today’s popular high-end suit brands, featuring darted seams and a highly tailored look and feel that really stands out. In March 2013 Medelita introduced the first “slim-fit” lab coat available for men seeking a more tailored look. The company sought to match an ongoing trend in the evolution of the modern fit for professional menswear toward a preference for European-cut, slimmer-fitting suits and shirts. Despite launching in March, the lab coat was the best-selling men’s lab coat sold by Medelita in 2013. The company’s new men’s slim fit lab coat is named after Dr. Harvey Williams Cushing who was a pioneer of brain surgery in the U.S., and was the first to describe Cushing’s syndrome. Cushing was at the forefront of neurosurgery while practicing in the U.S. and in Europe during and after World War I, where he attained the rank of Colonel in the U.S. Army Medical Corps. The H.W. 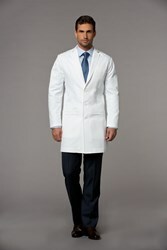 Cushing slim fit lab coat represents the most innovative presentation of style and taste for physicians whose appearance is an outward display of aptitude, credibility, and trustworthiness. The slim fit lab coat looks and fits like a modern suit, with performance fabrics to ensure that stains roll right off the coat. Medelita CEO, Joe Francisco explained, "The high demand for our first slim fit men’s lab coat helped us realize that men are definitely looking for an alternative to a cheap and boxy lab coat. The H.W. Cushing fits more like today’s popular high-end suit brands, featuring darted seams and a highly tailored look and feel that really stands out.” The H.W. Cushing will be available for purchase with or without personalized embroidery online at http://www.medelita.com starting on January 20th, 2014. Medelita is redefining the way healthcare professionals present themselves at work. Combining innovative, certified, performance fabric technology with sophisticated designs and hand-tailored workmanship, Medelita offers the most refined, comfortable and functional gender specific lab coats and physician scrubs available. Exquisite detailing and traditional sizing ensure flattering shaping, an unsurpassed professional appearance and a vastly improved fit. Quality is so exceptional, the company provides a One Year Guarantee – which is unmatched by any other medical apparel manufacturer in the industry. For more information, visit the Medelita website at http://www.medelita.com or call 877.987.7979.